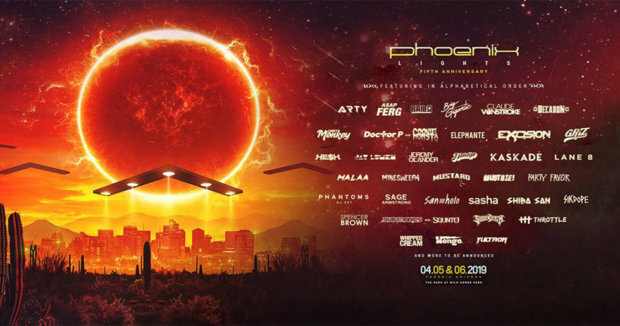 Relentless Beats is bringing back Phoenix Lights Festival for its 5th year anniversary Saturday, April 5th and 6th, 2019. The invasion will take place at The Park at Wild Horse Pass in Chandler, Arizona… and I couldn’t be more excited for this annual EDM festival inspired by the legendary local UFO fly-by. Befitting the extraterrestrial theme, mockups of crashed UFOs and alien-like artworks will also be located around the park. Phoenix Lights will feature two days of performances by superstar DJs and hip-hop artists. It includes such names as Claude VonStroke of Dirtybird Records, bass oddity Excision, and Grammy-nominated producer Kaskade. This has proved to be a perfectly diverse and stacks lineup anybody can enjoy! Phoenix Lights has experienced extraordinary growth over the past couple of years and for its fifth anniversary, we know that Relentless Beats will pull out all the stops.